The 1830s were ten years of intense activity for Donizetti. During the decade he presented no fewer than twenty-seven operas and wrote another, Poliuto, which because of censorship in Naples was not staged until 1848. Of these operas only five were in lighter vein, the overwhelming majority being designated �seria�. The works of the decade were predominantly premiered in Naples and Milan with the odd sortie to Venice and Florence. Whilst Donizetti was in Naples for the premiere of L�assedio di Calais at the San Carlo on 19th November 1836, fourteen months after the premiere of his 47th opera Lucia di Lamermoor in the same theatre, the composer wrote Pia de� Tolomei. This was to fulfil a commission from the impresario of the Teatro La Fenice in Venice. It is his 52nd operatic title. With the writing complete he left Naples, by boat, on the first stage of his journey to Florence. Because Naples was in the grip of a cholera epidemic Donizetti was quarantined in Genoa for eighteen days. Whilst in Genoa he learned that La Fenice, the premier theatre in Venice, had been destroyed by fire on the night of December 12th, 1836. The La Fenice season was transferred to the smaller Teatro Apollo. Reluctantly, the composer whose fee was already less than he would have received in Naples or Milan, agreed to a reduction. The opera reached the stage on 18th February 1837. Fanny Tachinard-Persarni, the wife of a rival composer, who had also created the title roles in Lucia di Lamermoor and Rosmondo D�Inghilterra , sang the eponymous tragic heroine. Like the earlier roles it is for a coloratura soprano with capacity for dramatic colour so as to portray the various, often fraught or tragic, circumstances in which Pia finds herself. Although the story of Cammarano�s libretto can be traced back to Dante�s Purgatorio, it more likely derives from contemporary plays performed in Naples and which involved something of the true-life story of Pia. In the opera Pia, wife of the Ghibelline leader, Nello (bar), has been propositioned by Ghino (ten) her husband�s cousin and whose advances she had rejected. Her husband sends Pia to safety from battles with the opposing Guelphs. Whilst there Ghino learns that Pia has had a letter indicating a male visitor and believing this to be a lover reveals the facts to her husband who in despair orders her to be poisoned. In fact the male visitor is her brother Rodrigo (mezzo) who fights for the Guelphs and who she has assisted in escaping from prison. Her husband further imprisones her in Maremma, a place of damp and fever and Ghino arrives and offers to help her in exchange for love. When Ghino learns that Pia�s supposed lover was in fact her brother she persuades him to tell the truth. On the way he is wounded by Guelphs and by the time Nello learns the truth and rushes to Pia he arrives too late to stop the poison being administered and Pia dies. At its premiere the opera was modestly received with disapproval expressed about the finale to act 1. Donizetti rewrote this finale with revised stretta during the Venice Carnival (CD 3 trs.1-6). He made more radical alterations for performances at the Adriatic resort of Siningaglia in July 1837 (CD 3 trs. 7-12). For Naples in September 1838 he was also forced by the censors to write a happy ending to the whole work (CD 3 trs. 18-21). William Ashbrook, author of the definitive book on Donizetti and his works, is dismissive of Pia de�Tolomei. I find myself in agreement with Dr Jeremy Commons� more favourable view as expressed in his comprehensive, if rather diffuse, booklet essay (pp. 10-60). Whilst not having the quality of musical invention of Lucia, there are echoes of that opera in the duets between Nello and Ghino (CD 1 trs 11-13). There are also Bellinian moments in the aria between Pia and her brother Rodrigo that occurs during the act 1 finale (CD 1 tr. 19, and its revisions). As is my habit with a work I do not know intimately, I first played the performance through complete, in order to get a feel for the music in relation to the story. This also enables me to get a first impression of the quality of the conducting and engineering as well as how the solo singers characterise their roles. Concurrently with my learning process with this Opera Rara studio recording, along came the serendipitous issue of the Dynamic DVD of performance in April 2005 at the newly rebuilt (after yet another fire) La Fenice. This live La Fenice performance is also available on CD. It never rains but it pours! It is not my intention to make detailed comparisons between the two issues. I am of the opinion that the DVD and this Opera Rara audio studio recording are wholly and ideally complementary. Both are based on the critical edition prepared by Giorgio Pagannone for the Donizetti Foundation, Bergamo although there are differences in the presentation of the act 1 finale. As I implied, I find Pia de�Tolomei, as exemplified in this performance, to be a dramatically convincing and musically cohesive bel canto opera. The performers and the recording engineers for Opera Rara enhance the innate virtues of Donizetti�s composition. On the podium David Parry draws refined playing from the London Philharmonic Orchestra whilst the Geoffrey Mitchell Choir, in their various guises, are as idiomatic and vibrant as any Italian chorus. As the jealous husband Nello, Roberto Servile sings with sensitivity to dynamics and good tonal colour. His portrayal is well characterised and vocally convincing (CD 2 trs. 11,12 and 16). These qualities and outcome are also to be found in Bruce Ford�s portrayal of the bad guy and would be seducer Ghino, who comes to a sticky but untimely end. As so often, one wishes that his tone were a little more mellifluous and touched with Italianata. Perhaps, but he sings evenly across a wide range, always on the note and in style; the listener can sense from his nuance and expression what is happening in the plot. These are qualities not to be undervalued. His portrayal of Ghino on this recording is an impressive addition to his extensive discography of bel canto roles for Opera Rara and elsewhere. The light-voiced bass-baritones of Marco Vinca (CD 2 trs. 1-2) and Mirco Palazzi in the inconsequential role of the hermit Pierro (CD 2 tr. 10) are convincing as is the bright toned tenor of Mark Wilde as Ubaldo, Nello�s servant (CD 1 trs. 2-3). In respect of the principal female singers I am a little more equivocal. I found Majella Cullagh�s singing a curious mixture. In Pia�s more florid passages she sings fluently, securely and with good tone (CD 1 tr. 8). She is less convincing in the critical scene in Maremma when repulsing Ghino�s further advances (CD 2 tr. 4) she affirms her chastity and pleads with him to tell Nello the truth about the identity of her nocturnal visitor (CD 2 tr. 5). Here she lightens her tone rather than adding colour and intensity as Patrizia Ciofi does in the live Dynamic performance from La Fenice. The same is true of her portrayal of Pia in her death scene (CD 2 trs. 16-17). Similarly my pleasure at Manuela Custer�s singing of Rodrigo was mixed. She has a lovely creamy tone and good diction but tends to overdo the vibrato in the interests of the drama but to the detriment of legato (CD 1 trs 15-16 and CD 2 trs. 2-3). Laura Polverelli at La Fenice manages to convey Rodrigo�s situation and feelings with smoother legato and greater vocal intensity. In the minor role of Bice, Pia�s attendant, Patrizia Biccire sings strongly and with good tone. The more I have listened to this performance the more convinced I have become of the work�s structural cohesion, and compositional strengths. 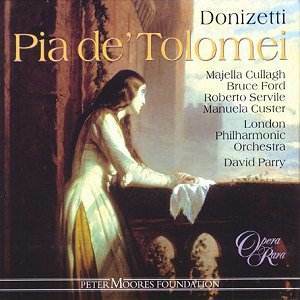 This recording of Pia de�Tolomei is a very welcome addition to Opera Rara�s unrivalled list of well recorded and performed Donizetti operas. Highly recommended to all lovers of Donizetti�s works and the bel canto period. Gaetano DONIZETTI (1797-1848) Pia de� Tolomei - Tragedia lyrica in two acts (1837) Libretto by Salvatore Cammarano based on the 5th canto of Dante�s Purgatory.